The face is a unique reflection of our genetic, inherited inclinations as well as the effects that life, nature, and relationships have had upon us. By looking at a person’s face, you can gain valuable insight into their personality, health, and how they navigate in the world. 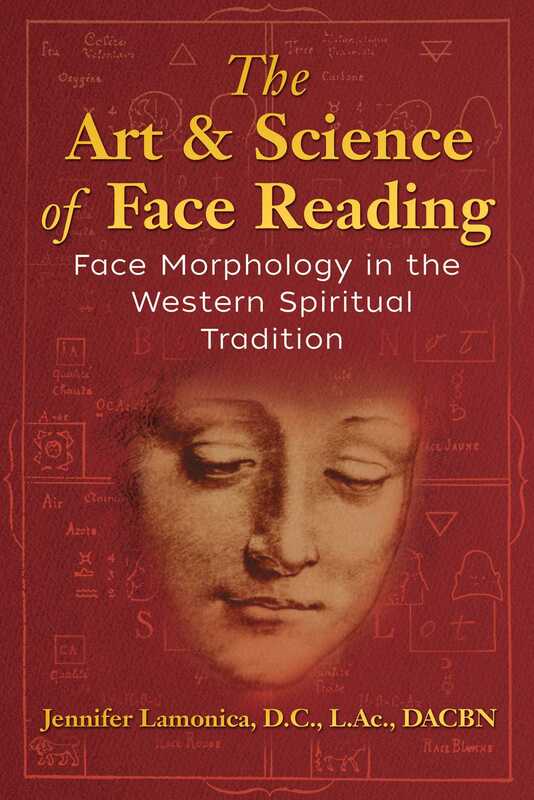 In this illustrated guide, Jennifer Lamonica reveals the sacred tradition of face morphology, an esoteric system that has been passed quietly from rabbi to student as an unbroken oral tradition for more than 4,500 years. She explores the history and development of this ancient art from its origins in Israel and Egypt to its use as the major diagnostic system in Europe until the Enlightenment and its current applications in French medical schools. Sharing the techniques of master face readers, the author details how to read the angles of the profile, as well as palm color and nose shape, to determine a person’s temperament, providing health and career insight into each of the four temperaments, including nutritional needs, digestive issues, sleep patterns, health predispositions, and ideal occupational paths. Exploring the Foursquare diagram, developed by French occultist Papus, for highly accurate and detailed facial readings, she explains how to read the front face in combination with planetary shapes, which reveal a person’s character; the major facial features, such as eyebrows, which reveal personal inclinations; and the musculature of the face, including expressions, which reveals a person’s current mental state. Providing case studies, she examines how to apply face morphology in relationships and in parenting. Exploring the meaning of each facial variation, while also honoring the intuitive impression received at first glance, Lamonica reveals how the ancient science of face reading allows you to compassionately help your loved ones, students, or clients, as well as overcome personal obstacles and better know yourself. The practice of face morphology has changed my life. For more than three decades, I have had the distinct privilege of evaluating patients using the ancient, sacred art of face morphology, or face reading, as it is often called. This book reveals the ancient understanding of the secrets of the soul held within the structure of the face. My intention in compiling and sharing this information is that it further enables us to have an objective awareness of our own personality, inclinations, and tendencies, both biological and psychological. As this is a sacred art, care must be given when reading an individual. It is important to get the permission of the individual before reading and reporting what you see in his or her morphology. During the course of my practice I’ve received permission from my patients to read their face, usually as part of my initial examination. Here is a surprising example of what one might discover using face morphology. It comes from the very early days in my face morphology career. One day a new patient walks into my office. I greet her and bring her in for an examination. I ask her if I have permission to read her face, since it would help to explain a bit more about her problem. I also explain to her a little bit about face morphology. She heartily gives me permission to read her face, which most patients do, since everyone is interested in learning about themselves. Within a few minutes, this is what comes blurting out of my mouth, "Who did you murder?" I had taken a leap in trusting what the face was telling me, but I did not expect the answer that she gave. She said, “My husband.” And of course, as I could see that she was in my office and not in prison, the judge deemed it to be self-defense. From that point forward, I began to see the rich efficacy of face reading. I’ve experienced countless other revelations with patients over the years which have allowed me to help them deepen their understanding of themselves. The study of face morphology largely refers to the bony structure that is inherited. When discussing face morphology, we refer to temperament, which is read in layers, beginning with the profile. There are four temperaments defined in face morphology: two are considered active (the Bilious and the Sanguine) and two are considered passive (the Nervous and the Lymphatic). In this chapter, we examine the four temperaments, each of which is analogous to one of the faces of the four creatures on each of the four posts in Ezekiel’s vision. It bears repeating that the Bilious represents the angel/man, the Nervous the eagle, the Sanguine the lion, and the Lymphatic the ox. In the pages ahead, short lists introduce each of the four temperaments. In these lists I mean to highlight some of the foremost features of people with that particular temperament. In my discussion, I also describe some of the common medical problems of each temperament and how the problems are most effectively treated. I hasten to add, however, that we are, each of us, all four temperaments, even though we are predominantly one and have the others as, secondary, tertiary, and quaternary qualities. Further, we all live by a 24 hour clock, and there are times in the day, which are defined as quaternary, whereby a person can have the most benefit from their own temperament. This relates to each temperament and the particular time that would be best for each of them. We begin with the Bilious temperament, which is the only temperament that shares two layers of the four dermal derivations. The Bilious type derives from the chordoblast (a combination of mesodermal and ectodermal layers) and the ectoblast. As with all the temperaments, I open with brief notes on major characteristics of the Bilious type to familiarize the reader with the particular quarter of the day, season, and disposition that is most relevant to the personality and activity of this type. When reading the Bilious profile from the left side as is the convention, notice that the forehead can be pouched forward like the shape of a reverse question mark. The range from an extreme pouch, to a lesser pouch, all the way to a straight line from the nasal bridge to the hairline is included in the Bilious profile. The jaw line (the outline of the mandible from the ear to the chin) comes down about two-thirds of the way to the chin; and the back of the head is like a bowling ball. The Bilious have an active, intellectual, objective outlook. They seek the actual and the concrete, and are effective gatherers of knowledge. They make things happen. They are constructors. They also may be willing to stretch the truth to serve their plan. The Bilious are a chordoblastic, medium-built people. They have black complected hair on their head, and the palms of their hands are often dark. From the back of the head they tend to look like a bowling ball. They have short compact muscles and need to be physical. They are very impatient with pain, and they tend to have more bone problems than do the other three temperaments. The Bilious types prefer cold, wet environments. They do not like to rest. They have stamina and like to keep going. They are excellent marathon runners. They need chlorophyll for oxygenation, and they need ozone. They have a great ability to utilize oxygen and burn it. Bilious thinking is not abstract. It is concrete, constructive, coordinated, controlled, organized, and they like things to be done to their exact wishes. The Bilious temperament likes a challenge and enjoys being victorious. Due to their strong will, sometimes they can exact claims and power over other people, which can be difficult in relationships with people of a more passive type. Jennifer Lamonica, D.C., L.Ac., DACBN, a student in the lineage of Colette Aboulker-Muscat, is a doctor of chiropractic, licensed acupuncturist, certified nutritionist, certified imagery therapist, and a face morphologist in the Western spiritual tradition. Also a certified medical technologist, she has taught at New York Chiropractic College, at the New York College of Traditional Chinese Medicine, and for the New York State Chiropractic Association. In private practice since 1984, she lives in Mineola, New York.